Need to be online while you’re on the move? You can work, surf and check your email via free Wi-Fi. Taking the original Mercedes Sprinter, the interior of this spacious van has been completely transformed into a luxurious and tranquil space, oozing decadence. 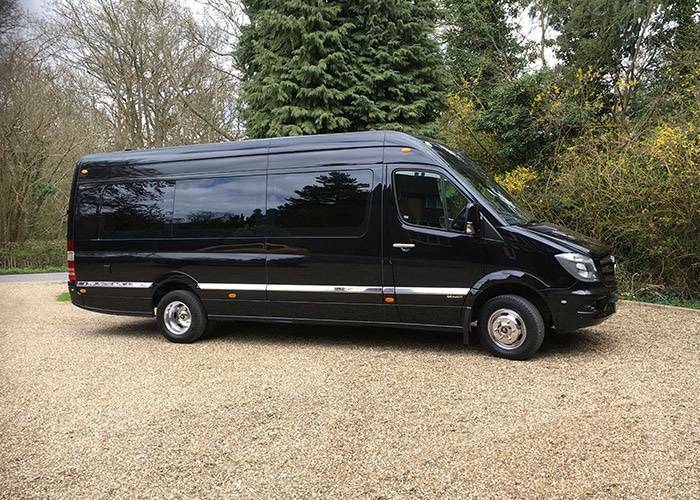 Comfortably seating up to eight passengers, the chauffeur driven Monaco Mercedes Sprinter offers a discreet and extensive space, perfect for groups travelling to events, corporate trips or celebrity chauffeur hire. Book a luxury chauffeur experience and you can sit back and relax in ultimate comfort, allowing your highly-skilled Mercedes chauffeur to handle the driving for you. 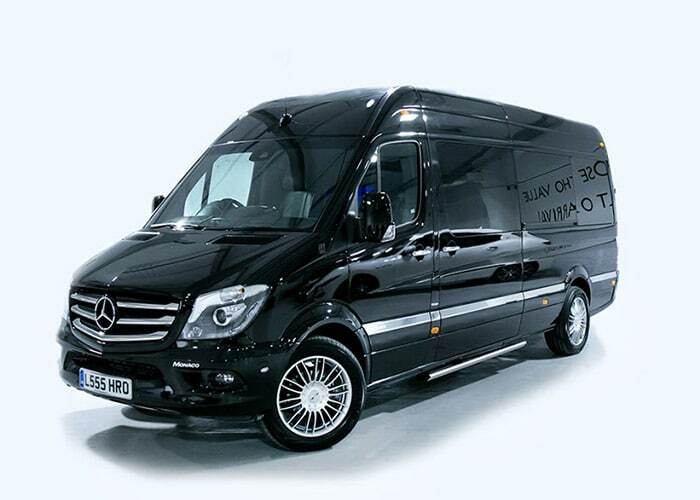 Whether you’re looking to book a chauffeur so that you can relax, socialise or catch up on work, the Monaco Mercedes Sprinter is an excellent choice. With a powerful presence and a hidden transformed area, passengers can be comfortably transported all over the UK whilst retaining a high level of privacy. This is ideal for families or groups looking for luxury airport transfers or wedding guest transportation. 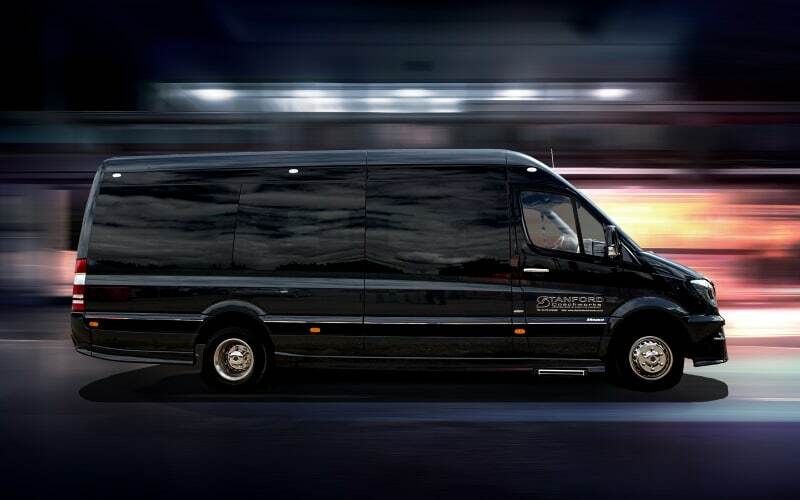 With its large space redesigned exclusively for chauffeur use and passenger comfort, the Monaco Mercedes Sprinter has a wide range of features included to make your journey easier and more enjoyable. From any seat in the van, passengers will have easy access to all settings, making the environment suitable to your preference. 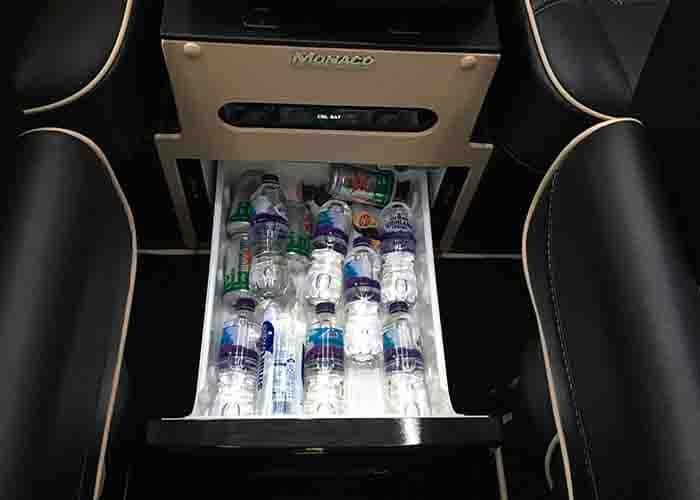 Luxurious extras such as a mini fridge and cooling areas help to ensure you have a relaxing journey. Aside from the modern perks, the Monaco Mercedes Sprinter also features high quality materials throughout. All design and interior modifications are made in Britain by expert craftsmen and designers. 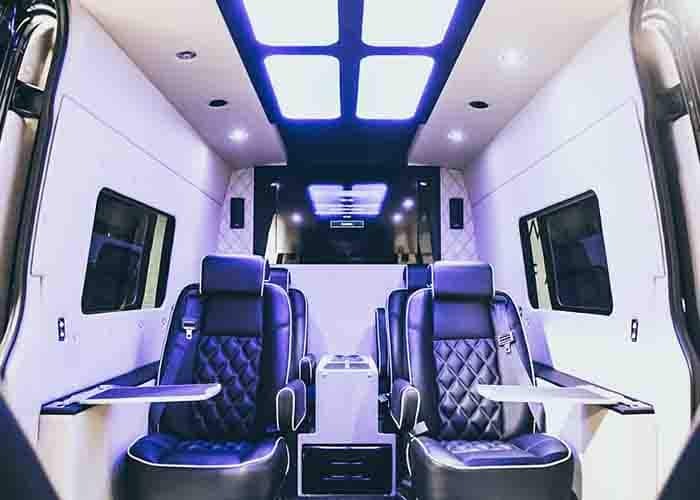 All Monaco Mercedes Sprinters are customised individually and features can include toilets, entertainment systems and drink systems as per request. Speak to our expert team if you have specific needs in mind and we will always do our best to provide a model which suits you. With this luxury chauffeur hire car offering so much as standard, we are sure you’ll find your trip sumptuously comfortable and relaxing. However, we also recognise that every occasion is unique and provide additional packages to make your experience that bit more memorable. From onboard hostess services to fine champagne and alcohol packages, we have something to cater for every need. You can easily add any of our extras at the time of your online booking or speak to a member of our team who will gladly be of help. Mercedes-Benz are always improving their standard safety features so that you can always have peace of mind. Your Mercedes chauffeur will have access to different driving modes and features helping to make sure your drive stays smooth and comfortable. Just like all the other beautiful cars that make up our fleet, our Monaco Mercedes Sprinter is always kept in pristine condition so that each client receives the same first-class environment. 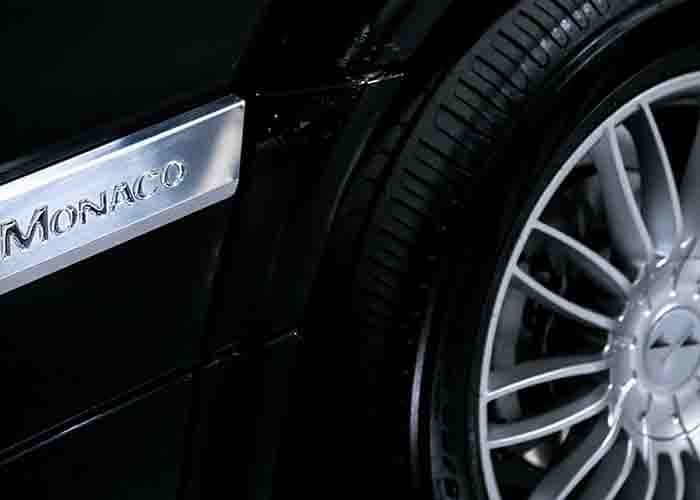 As well as making sure our cars are a great reflection of us, we do the same with our chauffeurs who are expertly trained, well presented and always ready to offer an impeccable service. We can collect and drop off to any UK address, be that home, a hotel or offices. The Monaco Mercedes Sprinter is also an ideal choice for wedding chauffeur hire in the UK, whether you need a luxurious vehicle to make sure the bridal party get there on time or you would like to treat your guests to something special. Speak to our friendly team and we can assist with any occasion. If you’re planning a trip to London, take advantage of our luxury airport transfers which will get you to your hotel quickly and efficiently. We also offer a variety of luxury chauffeur packages to enable you to see the sights of London or any other UK city with our full or half day prestige chauffeur tours and let us take the stress of planning your travel out of your hands so you can enjoy your trip. The V-Class is always our first choice when it comes to chauffeur services with Starr Luxury Cars. 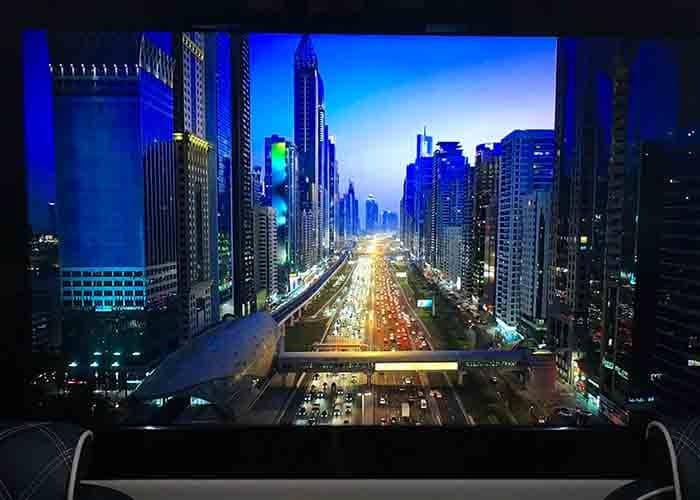 We are very impressed by the service that we have received and the extra options available. A fantastic company with an even more impressive attitude towards customer service. The chauffeur service that is provided to us on a weekly basis for our clients is second to none. The V-Class in particular is our vehicle of choice due to the spacious cabin and the optional extras which provide our business clients with a comfortable environment for them to prepare for their onward journeys to and from the airport. We recently used Starr Luxury Cars for a corporate track day and hired several Aston Martins for our team. Starr Luxury Cars organised delivery of all the vehicles and collected them afterwards and the customer service was fantastic. Thanks Ike and the team.